There are sometimes days when familiar surroundings feel like uncharted territory. It was hot and still, and the sea around Burgh Island was smooth and benign. 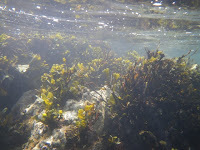 The water was calm and clear; we could see every frond of seaweed as we swam over rocky mountains and chasms below. It was so still that we were able to go in and around the rock formations that surround the island, venturing through channels and into coves and caves. At one point we came up against a vast, chunky, almost geometrically carved cliff face that looked, as my friend Anna said, like something out of Lord of the Rings. We were truly in another magical and mystical world. Organisation. Precision. Timing. This was the Hospicecare charity one mile swim at Roadford Lake near Okehampton. It was a distinct contrast to other 'organised' swims I've done, which have been anything but. We were colour-coded according to the 'wave' we were setting off in, and then herded into pens before the start. Although the competitive, serious swim isn't really my thing, there were some lovely people there and we had some nice chats. Rummaging around a charity shop in Paignton I found an old postcard that stopped me in my tracks. On the picture side, there was a photo of the Avon estuary at Bantham. 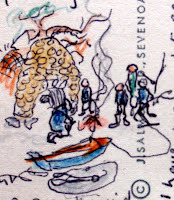 On the other were charming drawings, illustrating a romantic account of a family's sailing trip in their boat Kipper up the river on the incoming tide, during which they stopped by an old kiln and made a camp fire. A true Swallows and Amazons adventure. Read the full story here. Autumnal afternoon sun, as well as a desire for the refreshing balm of the Dart, drew us to the river. Rather than just swimming around we felt like going from A to B. We went in at one of our favourite places, which we call, unimaginatively, the Big Rock. Well, it is in fact a noticeably big slab of rock. We then floated, swam, crawled and slithered down the river towards Spitchwick, going through various little waterfall junctions en route. The water was particularly clear and beautiful, probably because there hasn't been much rain in the last week or two. It's a classy swim when you get medals AND cakes. I had heard on the swimmers' grapevine (well, from my friend Sue actually) about a charity race across the Fowey estuary. So a small group of us headed over the Tamar, where we found a brilliant trio of women dressed in old-fashioned swimsuits and flowery caps organising the event. It was a rare chance to swim in Fowey Harbour, which is exceptionally pretty; swimming there is normally banned. 86 of us, accompanied by canoes and various craft, swam to the other side of the estuary and back. We all got big gold medals and scrummy customised cupcakes afterwards. The latter courtesy of a local firm called Big Buns.